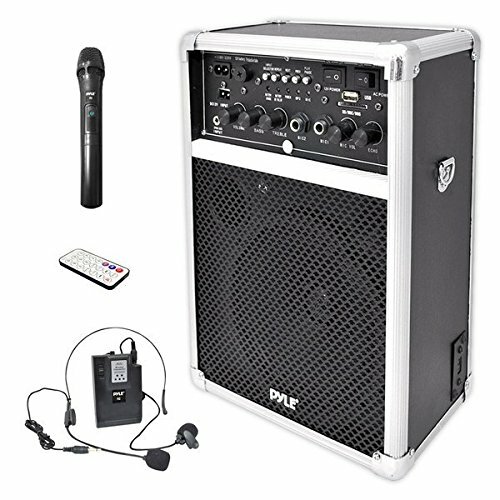 The Compact & Portable PA Speaker from Pyle Pro includes two wireless microphones, one handheld & one Lavalier microphone, to broadcast your voice to a large audience. Don't want to go wireless? Plug in a wired mic, guitar, or other instrument using one of the two built-in ¼' input jacks. You can also use the PWMA170 to play MP3s from a USB stick or SD card or connect an external MP3 player like an iPod or iPhone via the 3.5mm aux-in jack. Add effects to your voice and tweak your sound with the echo, bass, and treble controls. Perfect for classrooms, tour guides, and business meetings. Runs on 110 V AC or 12 V for car use. PORTABLE AND POWERFUL: Thanks to its 6 inch subwoofer and 400 watt peak, this Portable PA Speaker System by Pyle Pro has enormous power, Full Range Stereo Sound Reproduction and incredible sonic performance in a relatively light package. AUDIO CONFIGURATION: The professional PA Stereo features a Front Panel Control Center with rotary controls so you can easily adjust the Volume, Bass, Treble, Echo to your desired levels. Perfect for dj party, music jam, public gathering. USE ANYWHERE IN THE WORLD: This compact PA amplifier loud Speaker can be used in America, Europe, and other compatible countries since it features a switch that lets you change between 110v and 220v. Comes with a wall power cable and DC 12 Volt clip connectors. RECHARGEABLE BATTERY: This box type battery powered heavy duty Speaker System runs on a 12V/2.6A Lead-Acid rechargeable battery and the set comes with a Handheld Microphone, Headset, Lavalier Mic for karaoke fun. Ideal for Personal, commercial, Indoor / outdoor use.